Bread-and-butter pickles are my absolute favorite pickle, hands down. When I was a little girl, my mother made bread-and-butter pickles during the short summer season when pickling cucumbers flooded the local farmstand. My aunt and her husband would drive to Pennsylvania from New Jersey, my mom would drag out her huge meat slicer, and the four adults set up a pickle production line in our crowded kitchen. It was an all-day affair, slicing the cucumbers, brewing up the brine and filling the quart jars with hot pickles. For some reason, maybe because it was such an ordeal, my mother and father never made pickles when they retired and moved to San Diego. Even worse, after they had passed away, I was unable to find the original recipe for those pickles, which dated back to my maternal great-grandmother. I guess I need to try some other recipes, but my heart isn’t really into it. Still, when I saw an easy recipe for quick zucchini bread-and-butter pickles in the current issue of Food & Wine, I decided to try it. I had everything on hand and was craving those pickles. This batch, I cut back on the salt and doubled the sugar. Because these are refrigerated pickles, not canned, I wasn’t concerned about the salt-sugar ration, only in terms of taste. Next time, I will throw in some chopped fresh dill. These aren’t as good as Mama’s pickles, but they are a step in the right direction. TIP: Unfiltered organic apple cider is available at Trader Joe’s. TIP: I sliced the zucchini using my handheld OXO mandoline at its widest setting. An easy no-canning recipe for zucchini bread-and-butter pickles. In a large bowl, toss the sliced zucchini and onion with the salt. Cover vegetables with ice water and allow to soak 45 minutes. Drain the vegetables and pat dry with a clean dish towel. To make the brine, use a medium-sized saucepan and combine the vinegar, sugar, mustard seeds, mustard powder and turmeric. Add half cup water. Bring to a boil, stirring until sugar has dissolves. Set aside, allowing brine to completely cool. Transfer the zucchini and onions into a glass quart-sized container. Completely cover the vegetables with the brine. Cover the jar and refrigerate overnight before serving. Pickles will last a week in the fridge. I am a complete sucker for pickles. I love the use of zucchini in place of cucumbers. 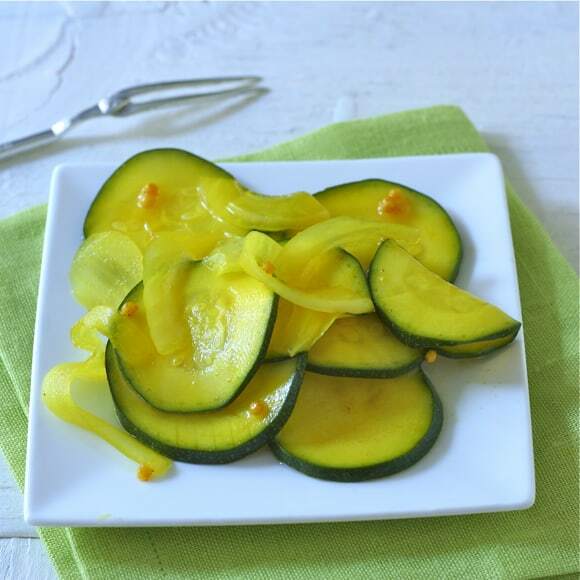 Love pickles and using zucchini is brilliant, they look fantastic Liz! Thanks, Suzanne, it took two tries but I think I will make this recipe a “keeper”. They look so good Liz, love the yellow from the mustard! You can always add equal amounts vinegar and water and still have a very safe recipe. I usually use, for example, if a recipe calls for 1 cup of vinegar, I will use 3/4 cup unfiltered cider and 1/2 cup white, then I match that 1 cup of vinegar to 1 cup of water. I know what you mean about choking on the vinegar! Also, If I soak the vegetables first with ice and salt, I always rinse very well to remove this salt, and I will add let’s say 2 tsp kosher salt (to 1 cup vinegar) and put it directly in the brine so that I can control how salty it is.The other great thing is that when you eat all these you can just place more veg right into the brine! I loved hearing about your family story too, sounds like alot of fun! I loved reading about the story from your childhood. It made me feel so good inside :-). And I love bread and butter pickles. I just ordered jars from Amazon and plan to do a lot of pickling next week, so this is perfect timing. I love that you used zukes too! This time of year everyone has too many zucchinis and then we miss them when they are gone. This is why I love pickling things. The sweet and sour is the only kind of pickle that my son likes. I love all pickled things. I am bookmarking this recipe. Thanks again. I was pleased by the taste, very “pickle-y” because I am not a huge fan of zucchini. Love this! I tried fermenting zucchini slices, and they turned to mush. Since that failed attempt, I’ve been meaning to go the quick pickle route. Looks like they hold up well. They do, Brandon – give them a try. Just wish so much that I had my mother’s/grandmother’s/great-grandmother’s family recipe. Pickles! Yummmmm… I’ve never tried to make them on my own. Will definitely have to try them out. Hope you try them – thanks for your comment. Hi Liz – I also love bread and butter pickles, especially with hard boiled eggs or tuna. I have never made pickles but I did make pickled onions the other day – YUM! So maybe this will be my next effort. Bread & Butter pickles are our fave! This is a great recipe for everyone who is over run with zucchinis right now. And for those of us who need some low sodium pickles!! Yes, low sodium pickles are a challenge, Priscilla – hope to see you SOON.